Yesterday, I started to tell Larry I was going to spend half an hour neatening our bedroom and ironing (in other words, keep the kids away! ), but I only managed to get out the words, "I'd like to spend..." when he interrupted with a beleaguered "Money?" Gee, financially stressed much, or what? So I made it worse by going to IKEA today with a friend. Nothing like piling on, right? I snapped up a Tullsta armchair (without the slipcover) in the "as is" section for half price. It was meant for Anna's room; but as she's not in my good graces right now, I put it in my room instead. Will my love affair for the affordable Ektorp line never cease? Hello, IKEA? Are you listening? Toss me some freebies, will ya? Thanks. I recently instructed Theo to do schoolwork on the computer as much as possible whenever Larry is home, in an effort to make him aware of our need for another computer. Apparently my evil machinations worked. Larry spent all day yesterday researching different laptop options, which made me practically agog with anticipation. Oh, the future looked bright indeed! I had the kids watch Obama's acceptance speech last night (I do love how Michelle dresses, don't you?) and afterwards Theo was asking me some questions about the election. After I had explained some of Obama's positions on the issues and why people wanted to vote for him, Theo asked, "Well, why do people want to vote for McCain, then?" Being an even-minded (read, undecided) voter, I listed some of McCain's strong points, ending with "He's an older man, which makes a lot of people feel that his judgment on important issues can be trusted." "Yeah," said Theo, "but Obama's really old, too - he's in his 40's already!" At which point I ended the discussion and dragged my ancient self up to bed. Yes, the unidentified object was (were?) 2 bananas, looking as though they had been bought sometime in the Pleistocene Era. I can't understand how they reached the petrified stage they were in without their oozing all over my counter first. Usually, it's the oozing that tips me off. So, thanks to everyone who played! And a special thanks to "A," the first commenter, whose comment made me go over to YouTube looking for a rendition of "Yes, We Have No Bananas." I knew the song existed, but I had never heard it until today. And now I can't get that darn tune out of my head. As I said, thanks. Thanks a lot. I managed to attend Knit Night last night; essentially, I walked out the door as Larry walked in from his 3-day management retreat, saying, "Retreat this, buddy!" (Okay, no, I didn't; but I wanted to.) There I was able to discuss with other women a problem that I didn't realize many of us married knitters share: a spouse who thinks that, when he speaks, he should have our full, undivided (i.e., not knitting) attention. Talk about not being on the same page, huh? Larry doesn't understand that the only way I can listen to him (or anyone else, for that matter) for an extended period of time is by knitting. If my brain isn't focusing on the knitting, it darts around thinking about laundry that isn't done, the kitchen that needs to be cleaned, meat that needs defrosting for the next day, etc. And when it does that, I am really not paying attention. This misunderstanding stems from the fact that men don't seem able to do two things at once. For instance, when Larry is on the phone, he needs to retreat to a perfectly quiet room and focus on his phone conversation. Isn't that cute? Ya wanna know what I do while I am on the phone? If I can do all that, I am definitely capable of knitting quietly while carrying on a conversation with my spouse, don't you think? But someday, if Larry runs off with some non-knitting hussy who sits and gazes soulfully into his eyes every time he utters a word, y'all will know it's my fault. And I can live with that. Going bananas here, can you tell? Can you believe it? 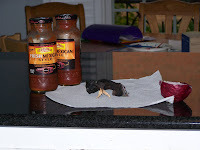 Look at this picture - I found only three items worthy of immediate disposal in my refrigerator this morning. Three! Can it be that this weekly exercise in public hu miliation is finally bearing fruit? Or could it be that when we got back from vacation on Sunday, I was so aghast at the state of my refrigerator (when compared to the pristine condition of the one at our vacation cottage) that I had to dump things right then and scrub out the bottom shelf and the vegetable bins? The second scenario, of course, would be the correct one. I should have taken a picture on Sunday, but Larry was there and I felt silly. Still, in order to make up for the fact that I have only 2 bottles of yucky salsa (but, of course) that no one will eat and half a dried-up red onion to share with all of you, I added to the picture a very special something that I found yesterday in a basket on my counter, trapped beneath 2 spaghetti squash that I've been meaning to cook for several months now. And in the meantime, Mom On The Verge has alerted me to yet another alarming confectionery trend - the gentrifying of traditional chocolate favorites. Picture it, folks - no more candy shell on your M&M's? A "...marbleized, almost metallic-looking finish in bright colors" instead? And at a much higher price? Is that where we want our country to go, chocolate-wise? According to the article, Mars "hopes to attract a young, fashion-conscious consumer to the product..." Now, what is up with that? Are those trendy twenty-somethings eating their candy, or wearing it? And could this be yet another instance of middle-aged women being dissed by society? I'm begging all of you, do not go gently into that dark night. The vibrant candy shell of traditional M&M's should not be tossed carelessly aside for the equivalent of a confectionery strumpet. Sure, M&M Premiums might look new and improved; but can they meet the high standards set by their predecessors? In other words, will they melt in your mouth, but not in your hand? I think not. I, for one, will stick with the M&M's of my youth. As they have stuck with me...on my hips and on my waist and on my thighs...but never, ever on my hands. Thank you. It is an honor being here tonight. In general I have pooh-poohed any dire assessments about America's current economic situation. After all, rising gas prices have been forcing Americans to make environmentally-friendly choices such as driving less and using more fuel-efficient cars; higher food costs are making us be more careful to get our nutritional bang for our buck; and the home-mortgage market implosion is forcing us to take a long, hard look at how we regulate that particular industry. But still, if you look closely enough, there has been a silver lining to the financial clouds which have been raining bad news down on the head of the average consumer for the past few months. Until now...now there is this piece of news. The sort of news that can make even a Pollyanna such as myself wonder, "Are life, liberty, and the pursuit of happiness viable options in a world where chocolate prices may go skyrocketing out of control?" And why haven't our esteemed presidential candidates addressed this particular issue? Oh, it's off-shore drilling this and war-in-Iraq that; but nary a word from either camp about rising candy-bar prices or imminent chocolate shortages... Tell me, is that the sort of leadership this country needs in the 21st century? When a friend local to the area you're visiting warns you about the traffic, you might want to consider that she just may know what she is talking about. My kids behave better when I pay attention to them before breakfast. In other words, my early-morning blogging habit has got to go. Novelty is indeed the spice of life. When we reached our vacation cottage, the kids were extremely excited to discover that there were bunkbeds! Even though we have bunkbeds at home! "Can we put the sheets on them?" they begged. What's up with that? One bathroom is not quite enough for seven people. Vacation has a strange effect on the space-time continuum, as evidenced by the fact that I had to do laundry less than 48 hours after we arrived at our destination, despite having packed 3 days worth of clothes for everyone. One can survive without the Internet, but it feels really weird. On a related note, world events can occur without my paying attention to them. Who knew? Any mother who insists on packing 4 bags of baby carrots for her family to snack on during vacation is tilting at windmills. In other words, we returned home after 7 days with 3 3/4 bags of baby carrots. Live bait is not an appetizing item to find in your refrigerator - especially when it is packaged in a container identical in size and shape to the hummus you were planning to pull out for a snack. It is not, I repeat not, possible to over pack for vacation when it comes to knitting projects. I realized this fact on the first day in the car, as I attempted to finish up a sock on size zero bamboo needles that insisted on splintering in my hands as I knitted. I managed, but it was ugly. And there I was, at a vacation cottage all week with time on my hands (read, no Internet access), 2 skeins of additional sock yarn, and no functional needles. I shudder to think what would have happened if I hadn't thought to pack a couple of skeins of Cascade Superwash and size 4 DPN's, along with Ann Budd's truly excellent book of patterns. As it was, my sock week turned into a mitten fest and all was well. But only because I over packed. I'm off to order some nice metal DPN's from KnitPicks. I've missed you all; but considering that Susie just woke up from a 3-hour post-vacation nap (on the floor - that's how tired she was), I should have plenty of time this evening to catch up on everyone's blogs while I wait for her to get to bed. Okay! All ready! Food cooked, clothes packed (um, except mine), toys packed (except mine)....actually, we're not ready. But, in honor of our going on a family vacation where Larry and I are sure to grab every opportunity to drag our children to historical or otherwise educational sites, I'd like to reminisce about the summer of 2003. Today we ventured out to Boston with the 5 kids, Larry driving and me reading the maps. But it's okay - I'm sure we will be on speaking terms sometime again soon. Larry blames MapQuest. I blame him, for bringing along a book of Boston maps which it turns out he bought at a used book store. Used, as in out-of-date. (He claims anything would be out-of-date, because of the ongoing road construction project in Boston). Also, for some reason, instead of having the map of New England states in our glove compartment, we had a Maryland map and a map for Norfolk, VA. These were not useful. Anyway, we found our way to the Freedom Trail and followed our very knowledgeable Nat'l Park Service ranger around Boston, listening to an over-detailed account of each site. Afterwards, we picnicked near the Old North Church, in a light but refreshing rain. We gambled that the rain would let up while we hoofed it over the Charles River to the USS Constitution. We lost. It didn't help that Larry had to drag an hysterical David over the bridge (it had those steel gratings and David thought he would fall through) while backpacking Rachel. Not exactly the pleasant stroll we had envisioned. But that's okay - we made it to the USS Constitution, where they wouldn't let Larry take his small Swiss Army knife on the ship with him. Larry decided to leave it in the diaper bag and leave the diaper bag in the stroller outside the entrance. He claims 2 people said that was okay. I don't know about that. We were down on the gundeck of the ship when an official-looking gentleman came looking for the owner of an abandoned backpack. Our abandoned backpack, as a matter of fact... So Larry went off with him, while I sat there and waited and waited and waited, and Rachel kept trying to throw herself down open hatches and screaming when I pulled her away. Finally I maneuvered all of us up the stairs and down the gangplank; we found Larry standing outside the entrance (sans handcuffs, thank goodness), looking extremely annoyed because they wouldn't let him back in. Turns out that, after Larry managed to convince the guards that the suspicious-looking backpack was nothing but a diaper bag, he attempted to re-enter (with the bag this time). The already suspicious guards found the verboten (and forgotten, by Larry) Swiss army knife during their bag search. This strikes me as very funny, but security guards aren't known for their sense of humor. The ride home was pretty much as disagreeable as the ride there, particularly because Brian and Rachel developed a game wherein they would shriek at each other in really high-pitched voices. I'm surprised the windshield didn't shatter. We broke down and stuffed them with hamburgers and fries for part of the ride (full mouths make less noise); but we soon ran out of ammunition, and I spent the rest of the ride promising myself that next time I would stay home. Or, better yet, they could all stay home and I could go by myself. I think we have had quite enough of family togetherness for the time being. That is just so cool, because tonight I was talking about Rhode Island and Amy lives in Rhode Island. And, no, I didn't peek in the bag at all. Sheesh. So, Amy, e-mail me your address. I'm hoping to mail these books tomorrow. Really. If you want to hear me say something good about my teens, go on over to my post today at MidCenturyModernMoms. This could be the start of something beautiful. Or, more likely, it's just a fluke. After nagging my husband into joining us at the pool this afternoon, I began feeling seriously unwell. So, I left him there. (Good thing we came in 2 vans). I'm sure Larry thinks I lured him to the pool with the intention of leaving him alone with the 4 youngest while I went home and took a nap. It was a great (3-hour) nap, though. I don't know what hit me. Maybe an entire summer's worth of sunscreen and swim towels and Italian ices, all at once. And I just had to lie down. We are leaving on Monday for a whole week, which means I need to spend all day tomorrow cooking and freezing dinners, doing laundry, and planning which knitting I need to bring. This last is a very involved process that necessitates itemizing all the yarn I own, perusing all my available patterns (including free ones on the Web), and (quite possibly) making a few trips to Michaels and to the bookstore to pick up more yarn, or patterns, or the right-size needles (which I have but can't find). Actually, I bet there will be 2 trips to Target. I am not the most organized person in the world. I walked into the den today just in time to behold Brian about to wallop Rachel over the head with a bolster. Good mother that I am, I yelled: "Watch out for that lamp!" Remember, to enter in the Bloggy Book Club Giveaway this week (Tender Mercies by Anne Lamott), go to Monday's post and leave a comment telling me you are interested. Also, the Rebecca who won the Giveaway from 2 weeks prior needs to contact me! Go check Monday's post and see if it is you. Thanks. Otherwise, I need to hold another drawing; and Lord knows how long that will take me. This news is blowing my mind. Let me see, we banned lead paint in housing almost 30 years ago; but we just got around to banning it in toys? I can't be reading this right. Someone explain it to me, will ya? Thanks. Nothing new about that, I do laundry every day. 3 loads a day, as a matter of fact. It's a hobby of mine. But laundry is on my mind today, because Jill over at Thou Shalt Not Whine was getting all defensive about not separating the kids' clothes into darks and lights before she washed them. Huh? We're supposed to do that? Really? Listen - my kids throw their clothes into their hampers (they each have their own, although the little girls share one); twice a week the older 4 haul their hampers downstairs, put their clothes in the washer, move them into the dryer (after I remind them), take them out of the dryer (after I remind them), lug them upstairs to their rooms (after...well, you get the picture), and leave them on the floor until I see the mess and yell at them to put it away, those are clean clothes, goldarnit, why are they on the floor? Me: "Where is your laundry?" Me: "Your laundry - remember? I told you to put it in the washer." Me: "Did you put it in the washer?" Me: "Okay - did you take it out of the washer?" Deep breath here. Must. Not. Scream. 8 times a week, I go through this. I don't do this because it's easy on me. I don't do this because I am lazy (Anna's theory). I do this because I want to have daughters- and sons-in-law who love me because I taught their spouses how to do their own laundry. I do this because I like to torture my kids. I do this because I do not see any point in mixing together everyone's clothes just to sort them out again at the end. Where was I going with this? I don't know. But I feel better. Thanks. Oh, yes - darks and lights...why bother? Do I really need to make my life any more difficult? (Um, the answer to that would be no - it's a rhetorical question.) So, Jill, I'm with you all the way. You launder anyhow you darn well please; it's a free country, you know. 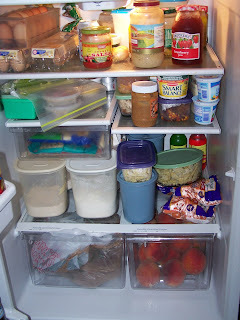 It's Wednesday, which means it's time to ask: What is moldering in Suburban Correspondent's fridge? In front, in the foil, we have our sacrificial egg sandwich of the week. As you may recall, we also had a sacrificial egg sandwich in previous weeks. You know how Jewish families leave a glass of wine for Elijah on the seder table at Passover? (Well, you do now.) Apparently, we leave Elijah an egg sandwich in our refrigerator; but he never eats it. Maybe he's not hungry. Or he's too soused on all that wine. Next to the sandwich, in the blue saran wrap, is a leftover chunk of Rachel's birthday cake, lovingly decorated by Anna. As I have no desire to see my 6 children argue over and then methodically divvy up this one piece into 6 exactly even portions, strewing chocolate crumbs everywhere in the process, I am dumping it tonight. My sanity is worth the food wastage. And what have we here, next to the cake? Is it...can it be...why, yes, it is 2 jars of salsa. Salsa! Imagine that! The one on the left is empty; and I can't get anyone to eat it the other one, because it is disgusting. 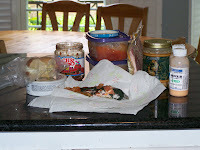 El Paso Fresh Mexican Style Smooth Chipotle Salsa - not a crowd-pleaser. Remember, you heard it here first. On the right, we have a head of cabbage that died a slow, horrible death in my refrigerator (ah, cabbage, we hardly knew ye! ), a squishy tomato from I-know-not-where, and a bowl full of something else tomato-ey. But it isn't homemade salsa, because the 2 containers of homemade salsa are still in the frig. They have not yet aged sufficiently to qualify for this weekly feature. 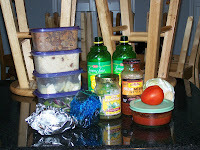 In the back, we have our usual contingent of Gladware containers, containing everything from refried beans remnants to scraps of homemade pizza toppings (from our dairy fest last week) to some left over raisin oatmeal that I had meant to force into my children because I am sick of wasting food. Alas, the spirit is willing, but the flesh is weak; so I never did follow through on that. And here, as a bonus, is a picture of some items I found lurking on my counter th is evening that you just may recognize: that's right, these 2 items are proud alumnae of this weekly feature! The cashew butter is still here from last week (because none of you slackers told me the proper way to dispose of it), and the 4th of July salad dressing has been hanging around for a full fortnight. Because I felt guilty getting rid of it. I'm waiting for someone to knock it onto the floor, I guess; at that point I can clean up the remnants and discard them with a clear conscience. Of course, that still leaves the question of what I am going to do with its identical twin that remains in my refrigerator. So stay tuned for next week's episode! Will the homemade salsa still be in the frig? Will Suburban Correspondent ever learn how to clean out a nut butter jar in an environmentally friendly fashion? And will Elijah eat his egg sandwich? All these questions and more will be answered next week, in As The Food Turns. Today Rachel turned 6 and, to celebrate, she had her first real birthday party. A real party, meaning people other than family were invited. I ran around the house all morning, cleaning up and ordering the kids to do the same. My bedroom looks like a storage closet because I grabbed all the clutter on the main floor and shoved it up there before the festivities commenced. It ain't pretty, but it works. Heloise, I'm not. While Rachel was opening her presents, I commented to my neighbor that it was such a funny coincidence that everyone gave Rachel Hello Kitty stuff and here we had Hello Kitty napkins, plates, etc., for the party. Whereupon my neighbor pointed out that the Hello Kitty invitations that we sent out last week may have just possibly tipped everyone off. Oh, yeah...I forgot about that. So I would like to go to bed early this evening, but I know better. I tried to do that last night, but I swear that Larry waits until I get up there to start snoring. Actually, he waits until I have just fallen asleep to start snoring. And then he has the nerve to act like he doesn't even know what's going on. Let me tell you, I don't believe him for a minute. This is just his passive-aggressive way of getting back at me for making him get rid of his ugly chair last December. Marriage can be complicated like that. Bloggy Book Club Winner! Finally! I lay around half of today with some undefined illness. I thought it was a cold, but then my skin started hurting. So then I decided I was dying. Maybe it's because I don't drink coffee. According to this article on coffee consumption, I no longer need to worry about my husband's several-cups-a-day coffee habit. Apparently, coffee is so beneficial, those of us who don't indulge should probably pay higher medical and life insurance rates. So now I have to worry about the fact that I cannot stand the stuff and am therefore more likely to suffer from heart disease and Parkinsons than is Larry. Somehow, that doesn't seem fair, as I am not the one with an addiction. And this article is suggesting that we switch to a kangaroo-meat burger. The scientist pushing for the idea stops just short of saying that kangaroo tastes like chicken (but I'll bet he is thinking it). Unfortunately, the article features a picture of a mommy kangaroo with a joey in her pouch; so the whole idea comes off as seeming rather mean. Plus, I've read Katy No-Pocket a few too many times to think about slathering her kin in ketchup and feeding them to my brood. And finally, the moment you have all given up waiting for...the winner of last week's (no, wait, 2 weeks ago) Bloggy Book Club giveaway is...Rebecca of...wait a sec...hmmm...I'm not sure. I think it might be Rebecca of Sunnybrook Farm - no, stop that! - of The Upside-Down World. That's a Wordpress blog, but I let her win anyway. Because I'm honest like that. Perusing Rebecca's blog (if this is indeed the correct Rebecca), you will find that she possesses an analytical mind which produces a well-thought-out opinion about absolutely everything. Her mental acumen impresses me, as I seem to have reached a point in my life where all I think about are blog posts, what to make for dinner, and how much longer is it until bedtime, anyway? So I read her blog and pretend I'm thinking about all that other stuff, too, just to make myself feel better. I'm living a lie, I know. So, Rebecca, if you wish to receive your copy of Leave The Building Quickly, just let me know your address, okay? And, really, I am going to mail all these books out this week. I have a plan. And this week's book? Hmmm....how about Traveling Mercies by Anne Lamott? (I know, I know, another memoir - I told you, I'm addicted to these things. Can't read just one!) Ms. Lamott is a liberal Christian writer (meaning that both those aspects of her personality are front and center in her writing). The stories of her life (her childhood as a tennis star, her alcohol abuse, her single motherdom, her conversion) make for some very interesting and entertaining reading - unlike, say, the stories of my life would make. Tell me, am I the only person in the world who did absolutely nothing growing up besides go to school, visit the mall, and talk on the phone? Occasionally I'd mix it up a bit by going to a friend's house on a Friday night, where we would eat Doritos and watch The Loveboat - but that was as wild as it got. Oh, and I went bowling once. I think. Anyway, I have no hilarious/heartwarming/thought-provoking tales to tell of broken curfews, crazy parties, the fallout of divorce, or the like. None. Nada. Zilch. I blame my parents. So I live vicariously (or, at least, voyeuristically) through Anne Lamott's stories. Some of the events described are pretty messed up (at least, that's the way they seem to a Miss Goody Two-Shoes like me), but the author tells them well with a sort of endearing, self-deprecating (but not deadpan) sense of humor. I suspect the NY Review of Books is not going to be calling me anytime soon to write for them. It's been a little quiet on the mouse front around here, hasn't it? That's because mice don't make a lot of noise when they are silently decomposing in the cabinet under one's kitchen sink. And, considering my housekeeping habits, does it come as a surprise that it took a while for the smell to tip me off? I thought the foul odor was coming from some rotting potatoes under the sink, actually. Of course Mickey made sure not to pass on before taking a dump in my silverware drawer, just like his predecessors. I hope none of you try to eat while you're blogging. Or if you do, rinse your silverware first, all right? For those of you interested in the progress of the felting project, let's just say that I learned last night the importance of keeping the ball bands (you know, the things which list the fiber content of the yarn) with your skeins. That way you don't waste an hour or so knitting up a project to be felted, only to discover that half of it felts and half doesn't. But as hope springs eternal, I am starting over...quitters don't knit, you know. Or is it, knitters don't win? and neglected to entertain Uncle Matt, who is visiting for a few days. Despite the neglect, he took us out to dinner anyway. Nice guy. Pretend you do not exist. But do not pretend the teen does not exist; this approach is generally taken as a personal affront. Actually, almost anything you do can be taken as a personal affront, so you're sort of screwed, aren't you? Pretend the world revolves around your teen. Inquire solicitously after his/her current wants (perceived by teen as needs); commiserate over the fact that he/she must live the life of a peasant. Buy your teen things. But only the items they designate as worthy of purchase. Take out loans if you have to. Reassure said teen that, as an adult, he/she will never be expected to do anything that he/she does not want to do. Only losers live like that. Losers like...hey! the parents of teenagers. Remind teen that he/she was probably switched at birth and grew up in the wrong family. This thought comforts adolescents immensely. It's all about knitting today (for those of you who missed the title); so now is a good time to exit if you are one of those benighted folks who just don't get it. A neighbor of mine who was just put on (first) pregnancy bed rest for an indefinite period of time said to me over the phone yesterday, "Maybe I'll learn to knit." And then we moved on to other topics. Ha, ha, of course not. I immediately offered to bring over my stash and my needle collection and a few books to help her out. It turned out that her husband (and I know you will find this hard to believe) had already gone to Michael's (do I hear a collective gasp out there?) and picked up 2 Learn-To-Knit type books for her. What a brave man! (He did, however, quail at the sight of the yarn selection and came home empty-handed in that department.) Is it an LDS thing, maybe? Do they raise their males differently than the non-Mormon population does? Because I am really impressed. Still, I had to assume that there was no way a knitting know-nothing (and male!) could wander into the aforementioned craft store, which is awash with knitting manuals and magazines and pattern books, and manage to emerge with the right books for a beginning knitter; so I hustled on over to their house anyway with one of my favorites (Knitting For Baby) to give her. But wouldn't you know, her husband's a genius! Or a knitting savant, at least...he picked just the right beginners' manuals, one of them equipped with a couple pairs of needles, a decent needle gauge, and a tape measure. I was stunned. I mean, what were the odds? Today I went to Michael's (yeah, twist my arm, will you?) and discussed the yarn selection over the phone with her as she described which projects she picked out (we settled on a chunky-wool scarf in the Ready, Set, Knit and the eyelet washcloth and blanket in Knitting For Baby), and then I bought a bunch of yarn for her (and more needles) and got her started on the 2 projects. And get this - she kept thanking me! Tell me, how many of you knitters out there wouldn't enjoy buying yarn with someone else's money? And how many of you would hesitate for even a moment to get someone else addicted to this lovely hobby? Is there any better way to have some fun? I stopped short of showing her the WEBS and the KnitPicks websites. Mostly because I didn't want to start drooling all over her laptop. I mean, have you seen these sock samplers? Talk about eye candy! My sock is coming along nicely - looks like 4th time is the charm around here. I also knitted up the ball project in Knitting For Baby, but now it requires felting and I'm not sure what to do (she types disingenuously, knowing that as they read this, knitters everywhere will be reaching instinctively for their keyboards to proffer help). The instructions say to felt it in a washing machine, but that seems to me to be a big waste of water and electricity (I'm just Ms. Environmentalist lately, aren't I?). Has anyone had success with felting by hand? Wow. A whole post about knitting...next thing you know, I'll be posting on Ravelry. I am so proud. This post of mine is number 3 on the page when someone Googles "self scan line idiots." Thank you, thank you very much. And this news item wins my "Too Gross To Finish Reading" prize of the day. I had to read the first paragraph or two, because I just didn't believe the headline meant what I thought it meant. But now I just don't want to know any more. An anonymous commenter yesterday sent me this link to an article in a Kansas newspaper about what is inside people's fridges. (I think I've tapped into some sort of cultural zeitgeist here.) Most of the women interviewed seemed to have fridges like mine. But there was one overachiever who is so proud of how her refrigerator looks on the inside that she bought a model with a transparent door, just to show it off. What can I say? There walk among us some who are not human. The Hotfessional saw my 3 bottles of salsa and raised me 12 (yes, 12) bottles of salad dressing. I happily bestow the title of Condiment Queen on her deserving vinagrette-ness. If I knew how to make one of those nifty blog buttons, I would do it and send her the code. She also (feeling bad knowing that she had bested me in the condiment competition) granted me an award that looks very pretty, but I have no idea how to show it here. It says "Brillante Weblog - premio 2008," which may or may not translate to "Brillo Blog - Prematurely 2008." That doesn't really make sense to me, but that's what the blogosphere is all about - you can say anything you like and it doesn't even have to be coherent. Actually, that hits a little close to home, now, doesn't it? But what about the kids, you ask? Here I am this week, posting about news articles and the contents of my refrigerator and finances and knitting, and where the heck are the children all this time? Are they foraging for themselves among all those rotting vegetables and bottles of salsa, looking in vain for something to fill their poor little tummies while their mother sits blogging? Happily, everyone has been well-fed this week, despite my out-of-control blogging habit. Theo (our milk-allergic kid) is away, so we've been having a dairyfest of sorts - homemade pizza Tuesday and today; ice cream with the not-quite-jelled peach jam yesterday; homemade whipped cream to go with our blueberries on Monday. We've done everything short of making a butter sculpture, actually. It is also a special birthday, because it marks exactly 2 years since Anna was stolen by extra-terrestrials and replaced with an alienated teen clone. Anna, honey, we wish you were here! We can't forget how you used to smile at us all the time and how you would greet every day like a present waiting to be opened. We sort of miss that. Is "maudlin" a word? It's looking funny. Next to the sandwich is an empty jar of salsa (which leaves only 3 jars of salsa left in the refrigerator, I just don't know how we will manage) and 2 Gladware containers - the top one contains a(n) UFO (unidentified food object) that fell out of my freezer today and hit me on the head; the one underneath has the remnants of yet more homemade salsa (can't someone stop us?) in it. Out they go! 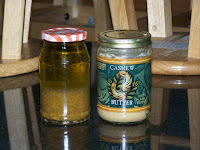 To the right of the Gladware is an almost empty jar of cashew butter, with the dried-up nutbutter still on the bottom. It has been sitting in my refrigerator for over a month because its disposal presents me with an environmental dilemma: do I toss the whole thing, glass jar and all? Or do I recycle the glass jar like a good citizen, which would require my expending untold amounts of hot water to clean it first? I'm confused as to which choice is the way to a smaller carbon footprint. Please advise. Moving on...between the Gladware and the cashew butter is expired bacon. I mean, twice-expired, really. I hate it when we waste meat, but somehow this guy was hiding at the bottom of the meat drawer and never got eaten. Probably because I put off cooking him because it is such a mess to clean up. Rest in peace, Porky. I'm sorry I'm so lazy. On the far right sit 2 bottles of unused Amoxicillin, prescribed for Susie's ear infection. Yup, that's right, I'm a monster - I never gave it to my kid. I said, "Let's wait a day before we dump gut-altering drugs into our 3-year-old," and by the time that day was over, she felt way better. Lest you think I am a total nut, when David had pneumonia at the age of 4...? I gave him the drugs. And believe me, he didn't make it easy. Where was I? Oh, yes - in the front you see this week's piece de resistance - a moldy zucchini, nestled in paper towels (because it was too gross to pick up bare-handed) and coated with loose onion skins from the vegetable drawer. Yum. Creations like this one take much longer than a week to evolve, so they may be a rare sight if I keep up this fridge cleaning on a weekly basis. I swear, this whole exercise in food-wastage confession feels almost cathartic. Go forth, my daughter, and waste no more! Now, a little catching up - a big thank you to everyone's supportive comments from 2 days ago when it sounded like I was whining about the prospect of having to go to work (for pay) part time. I wasn't so much whining (well, maybe I was) as expressing dismay at my becoming someone who would rather take the time away from hearth and home to bring in some extra money than stay home and cut a few more corners. That preference is sort of a new thing for me, and it took me by surprise. But maybe I'll stay home anyway, and we can just ditch those pesky medical and dental insurance premiums instead. As you've seen, half the time I'm not even using the drugs they're giving us. Let me just say, I fully sympathize with these parents. Not only have I left 3-year-olds in bakeries and in elevators; but I also remember a particularly unfortunate incident from a number of years ago. I had taken the children to the neighborhood pool and, as a treat, Larry showed up an hour later and joined us. A lovely time was had by all. Then we headed home, in 2 vans. I got home first and was changing out of my wet swimsuit as Larry walked in with the kids. The phone rang. I picked it up. "Mommy?" said a voice into my ear. "Excuse me, who's calling please?" I asked, confused because I knew that anyone who should be calling me Mommy had just come through our front door with my husband. Refusing to accept the obvious, I yelled downstairs to Larry, "Larry! Where's Anna?" Said Larry, "I thought you had her!" One of those days, folks....I don't even want to talk about it. But whoever stole my pleasant eldest daughter 2 years ago on her 13th birthday? I'd like her back now, please. The look of bored alienation that seems to be permanently affixed to her face is getting to be more than I can take. Due to our realization that our budget for the year has been blown to heck (a root canal and dental crown, 2 pairs of eyeglasses, bad driving, more bad driving, and community college tuition will do that to you)(not to mention a wife who refuses to camp), Larry and I are trying to reassess our already rather frugal spending habits. This exercise in belt-tightening is not recommended for weak marriages. Divorces are expensive, too, you know. Truth to tell, I don't know how willing I am to cut back. It has already been documented in these pages(?) that we are cheap with our kids (those nice camps the teens attended this summer? they paid for those themselves) and cheap with ourselves. At this point I'd rather just get a part-time job and the heck with it. Yeah, I could make our own soap and never, ever buy my kids so much as a single french fry; but I'm just not willing to go there anymore. This is hard for me to admit, as I have spent much of the last 17 years priding myself on being willing to make the economic sacrifices necessary to be a SAHM in this day and age. And now? I just don't care anymore. What is it about if you live long enough, everything you are so sure about sort of falls to the wayside? I hate that. I mean, at one time I knew all about how to raise kids in a kind, loving manner - no harsh words or punishments needed here! But when this misguided approach to parenting produced a 6 and a 4 year-old who were spoiled brats, we had to throw the soft-sell discipline out the window. Then I knew all about how to discipline my kids so they wouldn't become self-centered, alienated teens. Heh-heh. Yeah, Anna gave me my comeuppance on that one. And now, now, I'm going to give up my cherished SAHM status for economic reasons? This threatens to deal the death blow to my already shattered ego. I mean, I don't mind being taken down a peg or two; but lately, I feel as if I am lying in a heap on the floor. This was supposed to be Saturday's post, but Larry hogged the computer all day yesterday trying to straighten out our finances. You see, I threw a teeny-tiny hissy fit in the morning and told him I wanted to leave town for more than 3 days and that I wasn't going to spend a week in a tent. And I didn't care if I already spent our vacation money on someone else's bumper, I need to escape in August just like everyone else does around here, dammit. So, he picked up on my subtle intimations of discontent (probably at the point when I threatened to dissolve the kids' college funds) and spent the day combing through our finances looking for some "extra" money. While he was at it, he attempted to deal with the confusion of our main credit card being farmed out to some new company that we didn't want; but that involved switching all our automatic payments over to a different credit card, and that meant trying to remember approximately 16 gazillion different passwords and PINs in order to access all the different accounts. I hate seeing a grown man cry like that. So I decided to deal with a minor knitting crisis while I waited my turn at the computer. You see, Anna's flute camp had a performance Friday evening; and knitting is the only thing that keeps me from acting up like a 3-year-old at these things, as it is all I can do to sit still through any sort of performance (much less a high school one) without sedation. But as I settled in my seat in the auditorium and pulled out the sock I was planning to work on, I realized that 1 of the 4 double-pointed needles I needed was missing. Folks, I felt as if I had just jumped out of a plane without a parachute. There I was, with nothing to do for 3 solid hours. I whiled away an hour of it retracing my steps and searching for my missing needle (size 0, bamboo - have you seen it?). That was fun, if unsuccessful. Then I spent the 2nd hour repeatedly taking Susie (who was behaving way better than I was) down to the water fountain and back up to our seats (that's what you get for feeding the kids high-sodium-content fast food before the performance). The 3rd hour, I slumped in my seat and mourned all that lost knitting time. So today I had to rummage through all my knitting bags (and they are legion) to locate the 5th matching needle. As any knitter knows, this sort of exercise is rife with regrets and self-condemnation, as it requires facing up to innumerable unfinished projects and a level of disorganization that makes the inside of my refrigerator look good. I unearthed things I didn't even know I had: 2 baby hats that I finished for Afghans for Afghans and then forgot to send; a vest I knitted for Rachel and never completed the neck edging on; a pair of socks that only need the ends woven in; a top-down hat that I started last October; and a bunch of yarn that I was supposed to have made into a mistake-rib scarf months ago. There were also assorted needles of indeterminate sizes, many tape measures, crumpled printouts of patterns, an old bag of cough drops, a comb, and a petrified french fry. So I did what any self-respecting knitter would do. I gave up and started a new project. I sat upstairs and knitted Susie to sleep, as it were; and when I came down, I found Larry sitting disconsolately in his chair, surrounded - nay, engulfed - by a year's worth of paperwork. "Everything's a mess," he said. "I'm a slob. I can't find anything." What can I say? We're a match made in heaven. Just remember, you heard it here first. The article mentions that age 48 is when "men's overall happiness exceeds women's overall happiness." Now, that makes perfect sense to me. That's just the point in life when many men dump their menopausal ball-and-chains to take off with some strumpet half their age. Is it any wonder the guys' happiness exceeds ours at that point? Of course, I'm not too worried about that happening to me, what with the deal Larry and I have worked out. Hey, guys - this post is a woman thing. You wouldn't understand. It's a wasteland out there for those of us approaching "a certain age." Remember all those fun books that used to greet us girls with every life change? The "you're becoming a woman" books (complete with diagrams - ewwww! ), the "how to make your husband do what you want" books, the "how to take care of your babies" books...I could go on and on. No matter what stage of life we were entering, we could rest assured there would be (too much) information on how to navigate it. Everything we did was examined and talked to death: the baby-bearing, the child-raising, the juggling of career and family, the how-to-have-it-all dilemma of the modern woman. Well, there ain't no books anymore. It's as if, once a woman is in her mid-forties and her kids are starting to leave the nest, she ceases to exist. Oh, yes, there is the occasional tome detailing all the wonderful things that can go wrong with our bodies once menopause hits; and then there is a slew of books telling us how to look/act/appear younger; but as for self-affirming, "what direction is my life taking now, aside from going for a mammogram every 2 years?" type books - it looks pretty bleak out there. What is the publishing industry telling us? That there's nothing to look forward to? That there is nothing left now but to ward off for as long as possible the inevitable physical deterioration which comes with age? If life expectancy statistics are worth anything, we've got a good 35 - 40 years ahead of us. So what's up with this strange cultural silence? I'm lucky, in that I'll still have young children hanging around well into my 50's. But even so, I'm feeling the cold wind of societal indifference that strikes even the most self-assured woman (and I'm talking to you, mrs. g) as she enters this all but uncharted territory of perimenopause and beyond. Are Michael's and numerous cats really all that's left to us at this point? Are we doomed to spend the rest of our lives in a strange netherworld invisible to the rest of society? Thank goodness we have the Women's Colony to look forward to.